It took a while to post today – all the cats (indoor and outdoor) were being so sweet and wanting extra love this morning. But here we are finally! Our card today can be interpreted a few different ways. What does it say to you? Meaning: Study, concentration and application, reflection, respect for science, philanthropy, bearer of news. On the flip side, this card could also indicate illogical thinking, rebelliousness, wastefulness, loss or unfavorable news. PTM’s Interpretation: This is a very earthy card. Some also interpret this knave as it’s time to be productive and to think and act for your long-term security. This is the time to plan your success but also, more importantly, to act to make it happen. 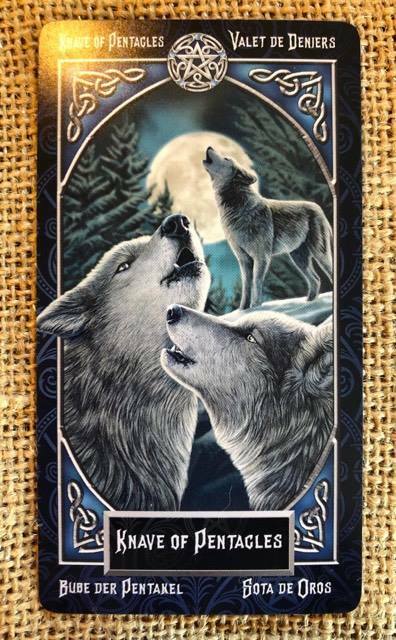 Also consider WHAT appears on this card: three wolves howling at the Moon tighter. In spite of their dark reputation from fairy tales and misunderstanding the species, wolves are not the biggest and baddest predators out there – mountain lions, for example, are bigger and stronger. To take down big prey (read: long-term security), they work together. Don’t forget to work with your life partner to find the best way to secure your family life. Reach out to others in your family, friend group, professional circles, and community to make things happen.